I have to retract Dolphin Viewer 3 3.3.15.24724, because it has some serious flaws on Windows. Please update to 3.3.16.24731 as soon as possible. Just because I am on vacation does not mean I have to stop adding stuff to the viewer, right? MAINT-1161: Sea level around private islands will now be at the same water level as the setting for the region. STORM-1899: Implemented fix for avatar hand poses randomly getting stuck in spread ‘starfish’ position. Ported from Firestorm: Added a feature to delete scripts in selection (see below). To use the “delete scripts in selection” feature, edit an object that you have modify permissions on, then select the function from Build->Scripts->Remove Scripts From Selection. Please note that this will delete all scripts from all selected prims without any further warning. If you use this on a no-copy object the scripts will be irreversibly lost. As you might know the top half of the list of third party viewers is sorted by crash rate … and you know what? In the last updated list, the Dolphin Viewer 3 is in second place! Dolphin Viewer 3 3.3.13.24707 is the second bestest viewer on the grid! Fixed: Don’t block texture fetch threads for 2 minutes if the CURL callback fails. Fixed: FIRE-6171/VWR-28846; ‘Save as’ dialog deadlocks on Ubuntu 12.04. Added more Windlight presets from Firestorm. Code in SLPlugin has been changed in order to limit the number of virus warnings from anti-virus s/w. It has been brought to my attention that Symantec products (Norton AntiVirus and PC Tools) pop up a virus warning about slplugin.exe when you install the latest Dolphin Viewer 3. I have scanned my build system for viruses – nothing found. I have scanned my laptop that I actually use for everything else besides building viewers – nothing found. I have submitted the latest slplugin.exe to virustotal.com – the result is here. In this process I have used Microsoft Security Essentials, Clam AV Antivirus, and AVG Antivirus. None of them have reported anything. To my best knowledge the current release of the Dolphin Viewer 3 is virus free. Yeah, a new version of Dolphin Viewer, less than 24 hours since the last one, Dolphin 3.3.13.24707 with properly working shadows and nothing else new. Oh by the way, you might have noticed that the filter texts for your inventory are UPPER CASE now, if you enabled that “Separate filters” feature in the previous version. Be assured that that is just an internal thing, and has been like that all the time. It was just not visible. The UPPER CASE filter text has no negative impact on the effectiveness of the filter. It has been brought to my attention that shadows are partially broken since a few versions ago. I’m working on a fix right now, and will release a new Dolphin Viewer 3 as soon as I’m done with it. Here is the next Dolphin Viewer 3, 3.3.12.24702. FIRE-6551 & FIRE-6823: Fix for sharing inventory items from multiple open inventory floater and auto-opening inventory. FIRE-6752: Rewritten, more accurate (and less needlessly alarming) script debit permission message. 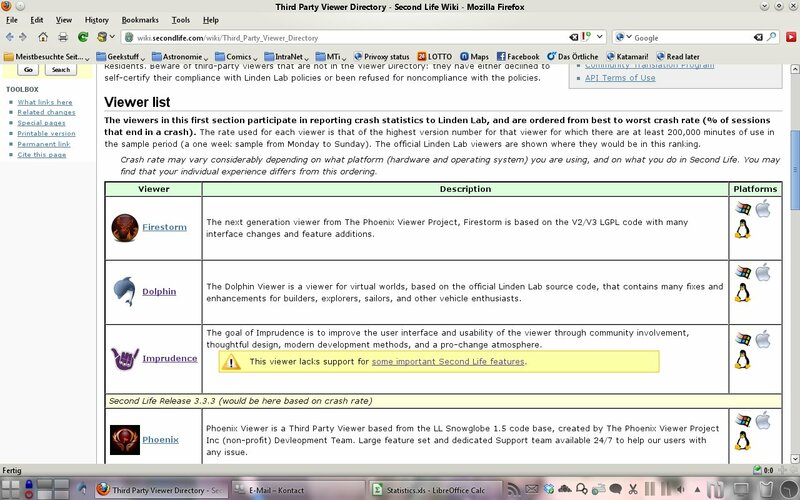 FIRE-913: Allow different search terms in inventory tabs – patch from Satomi Ahn. “Return to last in-world position” for items in your Lost+Found folder had to be removed since Linden Lab killed the serverside parts of it. Too bad! That was a useful feature. FIRE-6774: Fix for bottom buttons appearing too low in the People floater – by Hitomi Tiponi. Control-shift-P to activate or deactivate the “Places” window. Alt-shift-P to activate or deactivate the “Picks” window.